Hasan, who is acting as his own attorney, faces a possible death sentence, if convicted. Col. Tara Osborn, the military judge, has entered a not-guilty plea on his behalf. Hasan has been charged with multiple counts of murder and attempted murder in connection with the November 5, 2009, shooting on the base near Killeen, Texas. Osborn has barred Hasan, a devout Muslim who is acting as his own counsel, from using a defense that he acted to protect the Taliban in Afghanistan when he opened fire at a post deployment center. Osborn said there was no evidence to support a "defense of others" claim. Opening statements in the long-delayed case are set to begin August 6. These skills can be helpful in a number of situations outside of the workplace.? They will help a person negotiate a better rate for a loan or something of that nature.? Deciding how you might best use these skills will depend on your situation of course. Solutions for getting sales, negotiating a contract or working to resolve a conflict are found within this type of training today.? There are different tactics that can be applied for different personalities as well as different situations.? As you work on resolving these issues, you will quickly learn that the various techniques will create a different reaction for each person. hang by the neck until dead.... end of story..
Why is this POS still alive... this was a terrorist act...NOT workplace violence.. no one yells Allah Akbar while shooting unarmed soldiers... he should have been executed by firing squad years ago... it is the politically correct crap and our President who have interceded on behalf of this muslim TRAITOR! Imo, he would spend the rest of his life in federal prison . Obviously the military does not want to execute anyone who has served their country . However , since this "might" be the case ,the federal government should take all states in American territory remove the death penalty completely. Killing him will never bring back those people. But eternity in prison or the feeling of watching that clock everyday till you die .. is human hell. He'll be convicted and sentenced to death which coincidentally will never occur. A military member hasn't been executed in over 50 years – not going to start now! This has already taken WAY too long. The cast is open and shut and Nidal (already justly paralyzed for his cowardice) needs to be dead. One of the worst aspects of this shartbird's case is that he would NEVER have had the opportunity to BE a psychiatrist WITHOUT Uncle Sam's help. He went to USHUS – the medical school for military officers.....we need to screen students before/during and AFTER who are accepted to USHUS when they begin to display radical behavior. We missed all the red flags on this degenerate mutant. He should have had his chain yanked LONG AGO, and been drummed out of the Army for conduct unbecoming – we've fired WAY worse guys that this dirtbag. The military has a tradition of hanging on to high ranking medical personnel (beyond 03) because it takes a long time to get them up to speed. He should just spend the remainder of his worthless life in Leavenworth and his military pay should be STOPPED immediately. Sorry about his family – but he should have thought about THEM before becoming a radical fundamental shartbird. This is a case about a well known radical muslim committing jihad on his time. The leadership within the military who failed to arrest this radical Islamic terrorist before he went on his well planned jihad should be facing the death penalty too along with this radical Muslim. What takes so long for this trial? He should have been hung by now. A hanging is the result of a capital case in the Military. He is a mass murderer and there were many witnesses. What this man did is an act of war againts our own military. He should be charged as an enemy combatant. How insane that any *global* defense of enemies could be used in an american court. Defending the taliban? Really? Don't his own words already move the case out of *workplace violence* charge? This man is a traitor and murderer, not to mention terrorist. I'd like to know who cleared him for military service. We already know that the White House is reponsible for the *workplace violence* misnomer. How much longer must we endure continual appearances from the Zimmerman attorneys and his family? We are sick of hearing how difficult life is for a man who killed a barely 17 year boy for absolutely no reason. He was not arrested for six weeks and then only because of the national outrage. Of course, this was far too late for blood samples to be obtained from George Zimmerman on the night killed the young boy. It is such a shame that only the killer could give his story; young Treyvon could not give his. Well you should learn to read first of all second he didn't break the law. If you don't like it get the laws changed. @USMC1371,in Florida marine we are trying to repeal this senseless wild west law...Acquittals have increased over 300% nationally since its inception in 2005 and by fate some reps family member or friends life was taken because this law you know it'd be changed over night!! I like Oklahoma's law and since they passed open carry crime has gone down. Criminals think twice when any potential target may be armed. I personally believe George Zimmerman is the one who has been tormented by the Justice Dept., even the President. As a result of all of this being turned into a "race trial", this poor guy and his family can not even go out in public, and he will probably never be able to get a job. The locals did not have evidence to try Zimmerman.....but Obama and his White House buddies decided to take this into their own hands, and make it a racial thing....They should be sued. He (Zimmerman) is the one to feel sorry for. A sworn-in Jury decided there was no evidence, and they had no choice but to render a Not Guilty verdict. This man is innocent. Probably as long as we have to look at the black racists whine and complain,. Stay on topic, please, This trial bears no resemblance to the Islamist terrorist Nadal. 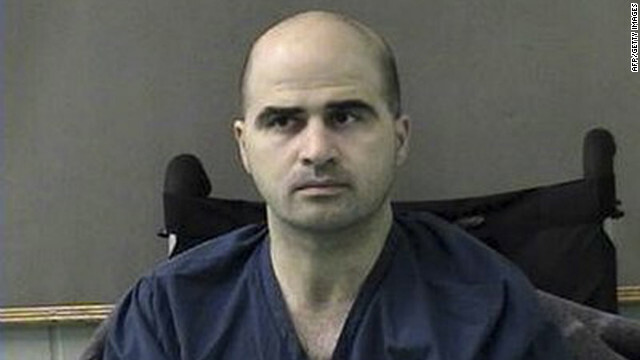 Maj. Nidal Hasan hasn't a ghost of a chance here with all the jurors engulfed in this right-wing lynch mob mentality. Then again, it really makes no difference considering the physical condition he is in. There is nothing they can do to further hurt him! Now let the ranting begin!!! He is still breathing so, yes he can still be punished. Sorry folks above post ain't mi. Some Hussain loving jerk is trying to make me look terrorist sympathiser. Not a problem. Stupid terrorist don't have a snowballs chance in hell of ever winning a battle, much less a war. They could still torture and behead him. I guess his opening statement would be "Allah U Akbur" "Allah U Akbur" "Allah U Akbur"
I would pay big money to see this piece of trash strapped to a chair and executed by multiple shots to the chest. I would prefer to see him dismembered by a cutting torch or thrown feet first through a wood chipper. SFC, I have often said that they need to put executions on PPV. I swear, with all the bloodthirsty fools in this country. we should be able to reduce the national debt by millions! For this trash to even get a trial is a shame. It's only a work related incident and not a terrorist act according to this administration. @California,hey parasite you just move along to your sand dunes !! Don't you have a camel to molest? I believe this this Maj. Nidal Hussein should have been instantly hanged. There were plenty of witnesses. If he doesn't get the death penalty there is something badly wrong with our justice system. I can't believe there haven't been signs of this man having these evil feelings before now.....who kept promoting him????? He doesn't deserve being kept in prison with the tax payers paying for his rent and food. The trial should be interesting. I'd like to hear his defense.